So, you think you know the Old West? Well, let me tell you, this here jail business ain't nearly as easy as you might think. It's tough to make a livin' jailin' bad guys - you've got to pay attention to you who you catch. Gangs'll get you the biggest bounty. You turn a Bandit Gang over to the Marshall and you'll make a mighty fine pile of bills. Problem is yours aint the only Calaboose in the county. No tellin' what those other Sheriffs'll send your way. A lot can happen on the trail, though, and there ain't no law sayin' you have to protect one bad guy from another. Well, there might be, but we don't like talkin' about it. 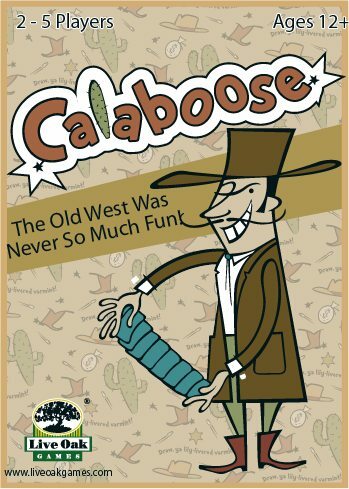 Another Description: In this fast-paced card game for 2-5 gunslinging lawmen, players try to fill their jails with the most valuable combination of outlaws and lock them down before anyone else can force them out!